Make your kitchen the heart of your home with Dream Doors South Beds. Speak to our designers and view our stunning collection at your local kitchen showroom in Dunstable, which services Luton, Leighton Buzzard and the wider South Bedfordshire area. Speak to our kitchen design team at your local Dream Doors South Bedfordshire kitchen showroom to plan and create a stunning bespoke kitchen for your home. Based in Dunstable, you can find kitchen ideas to suit every taste and speak with our local experts who can help you customise your ideal design. Our South Beds showroom, owned by Mark and Anne, serves the Luton and Leighton Buzzard areas and they will be happy to discuss your requirements and help you create your perfect kitchen. Mark and Anne can show you the wide variety of options available to you including our classic, traditional, modern and contemporary designs. As well as our online kitchen design tool, you can also schedule a consultation with Mark or Anne, who can come to view your existing kitchen space and provide a no obligation quote based on your ideas. This is a practical solution should you need some first-hand expertise and ensures our design team can get to grips with your project quickly and efficiently. 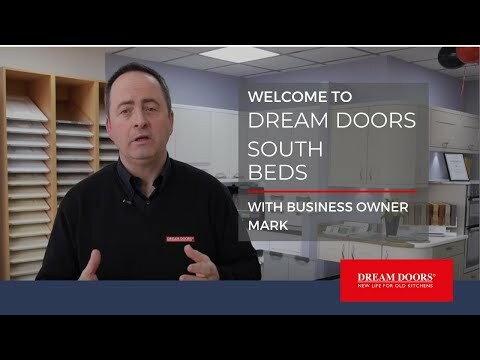 Dream Doors South Bedfordshire's service is provided by Mark and Anne in the LU postcode area – Leighton Buzzard, Dunstable, Luton and the surrounding villages including: Barnfield, Billington, Biscot, Bramingham, Bushmead, Caddington, Challney, Cheddington, Crawley, Dallow, Eaton Bray, Edlesborough, Eggington, Farley, Harlington, Heath and Reach, High Town, Hockliffe, Icknield, Ivinghoe Aston, Kensworth, Leagrave, Lewsey, Limbury, Linslade, Mentmore, Northall, Northwell, Pitstone, Round Green, Slapton, Soulbury, Stanbridge, Stewkley, Stopsley, Studham, Sundon Park, Tebworth, Tilsworth, Toddington, Totternhoe, Whipsnade, Aley Green, Woodside, Pepperstock, Woodside, Slip End, Chiltern Green, Cockernhoe, East Hyde, Lawrence End, Lilley, New Mill End, Peters Green, Tea Green, The Hyde, Wandon End, Wandon Green, Winch Hill, Streatley, Chalton, Bidwell, Chalgrave, Houghton Regis, Thorn, Hollywell, Sewell, Bragenham, Briggington, Burcott, Chelmscote, Clipstone, Crafton, Cublington, Grove, Horton, Hollingdon, Ledburn, Leedon, Stockgrove, Wing, Wingfield and Wigmore. "A professional service from beginning to end. No hidden extras. The quality of the workmanship is excellent, as was the advice." "Started work on the agreed day and arrived early in the morning. very high quality job and fitter very tidy.Very happy."